Fixed Attenuators are waveguide components for introduction of some particular attenuation value in to the waveguide network for signal leveling or reflection compensation. The attenuators have two types of design: with resistive plate in the waveguide diagonal plane or using coupling technology. 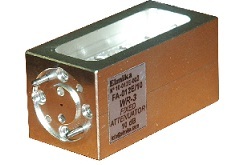 The FAXE 3, 6, 10, 15, 20, 30 dB attenuators are available in waveguide bands from 18 through 225 GHz. The FAXE Fixed Attenuators can be used as laboratory Standards against which other instruments or devices are calibrated in case the parameters of these Fixed Attenuators are stable enough and were measured with appropriate accuracy. Fixed attenuator for 33 - 50 GHz frequency range, silver plated.